This farmer's cheese come from a small farm, with limited production, near Rocamadour, in the Lot area, which is part of Dordogne. It's a beautiful, super white raw milk goat's cheese with a design of a cornucopia made of sweet (non-spicy) pepper, which is there for the look but adds no flavor. La Pelta is made in the same spirit as a Pélardon. Besides having a soft, mildly goaty flavor, it also has an unctuous, creamy texture. The rind is delicate but, thankfully, just strong enough to hold in all the oozy wonderfulness of a cheese warming up. THE STORY: What's Your Arrondissement? When we were planning our move to Paris, we had thought of living in the 6th or 7th, where the schools are known to be good, till one of our good friends, a Frenchman who had lived in Paris himself, quietly appraised me and said, "You're not a 6th or 7th sort of person." They're lovely places to live, and it seems like most expats choose these neighborhoods over all others. But he was 100% right; I'm just not 6th or 7th enough. 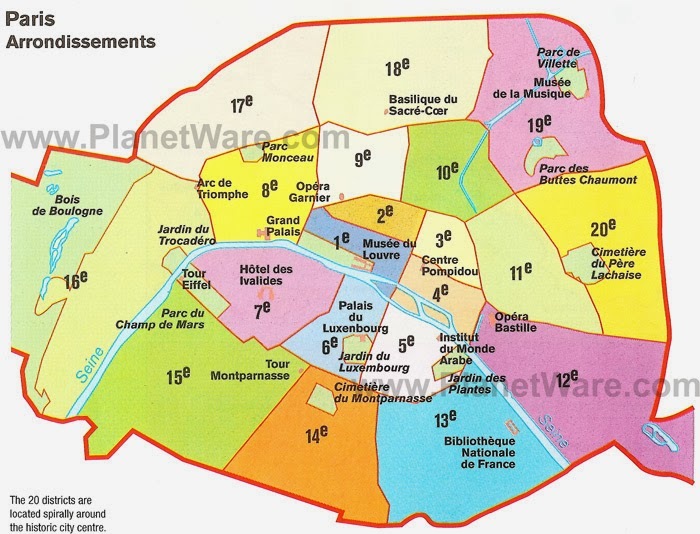 Every breakdown and guide to Paris' arrondissements I've seen focuses on the tourist sites in each area. But if you live here, what does your arrondissement say about you? 1: You might be an old Parisian family, with money, who likes luxury -- the Place Vendome and Van Cleef and Arpels store are nearby for example. You will know what Van Cleef and Arpels sells without Googling it. You also like being in the center of things. 2: You may well be a recent Turkish or Chinese immigrant, especially one who works in the textile industry, or possibly as a baker. My friend taught in a public school here and about half of her students were Turkish and Chinese and really didn't speak French. 3 & 4: Together, they are known as the Marais. This medieval section of town -- narrow alleys, old buildings, winding streets -- used to be the Jewish quarter, and still is in many ways (at least, it's the best place to go for bagels, falafel, and menorahs). While the rest of Paris was getting renovated, the Marais was still rat infested and cheaper. And, therefore, artists moved in. And, therefore, the gay community moved in. And, therefore, between the artists, the Jewish population, and the gay community, the area gentrified drastically and is now too expensive and Bobo for the artists who helped make it. From the lineage, you can probably tell: it's a hip, funky area of town. The 4th is more expensive and desirable than the 3rd. And while you will be comfortable here if you are Jewish, or gay, or artistic, you will especially love it if you happen to be a gay, Jewish artist. (I am an artsy gay-friendly writer of Jewish descent, so this is where I live.) You will also love it if you are fantastically wealthy, possibly in politics (DSK) or show business. 5: The Latin Quarter, so called because in medieval times, the first schools were here, and the boys were taught in Latin. It still has many narrow medieval streets and also some of the best schools, including the most celebrated French high school, Henri IV, as well as one of the most celebrated universities in the world, the Sorbonne. While people aren't speaking Latin anymore (except a few stressed out students, that is), it's still a very scholarly zone. That means lots of cheap noodle joints, as well as some adorable tourist streets and good shops. You are likely to live in a tiny room here if you're a college student, or a nicer (but still not huge) apartment if you're a professor. 6: You will live here if you are Gerard Depardieu -- unless you decide to take your millions to Belgium to avoid heavy taxes. Saint-Germain-des-Pres is a historic, Left Bank area, but less intellectual than the 5th. You're fully bourgeois, so you also like more exclusive boutiques, designer clothes, and expensive shoe shops. 7: You are likely to live here if you are an ex-pat on an ex-pat package who likes to be near all the foreign things you need -- stores, groceries, international schools. If you are French, you may be Karl Lagerfeld. Or at least well-off. 8: You might be high up in an embassy, or you might be a Shiek. Or, you might be one of the wives of an oil-rich Saudi Arabian who is enjoying her huge 3-bedroom Parisian pied-a-terre. An acquaintance joked her apartment in this arrondissement would sell to some Saudi Arabian for one of his wives and, sure enough, it did. 9 & 10: Are you young enough that you still think it's OK to start your evening at midnight? Have you recently been drunk, partied, or had a random hook-up? Do you like graffiti, prostitutes, and some litter to let you know you are having an authentic urban experience? If so, you might be a good candidate for the 9th and 10th, both of which are on the outskirts of the gentrified area. They may be the next to go, but they're not there yet. 11: If you like your hip and funky a little on the grungier side, or if you like a little more apartment for your money, or if you don't have kids and therefore don't need to worry about school zoning, then you might choose the 11th over the 4th (or 3rd). You are just on the other side of the Bastille from the Marais and get to enjoy it without living in it. 12: You are solidly middle class. You may work in the arrondissement, but there's a good chance you work on the eastern side of the city and like being able to commute easily both to work and everything that is central Paris. You may also like the idea of being near a huge park (Vincennes in this case) but can't afford to live in the 16th (near the Bois de Boulogne). 13: You might well be Chinese, as this is where Paris' Chinatown is located. Or you might be somebody who would like to live in the 5th, but can't quite afford it. It's possible you could be both. You may enjoy living in a tiny village -- Butte-aux-Cailles -- that used to be outside of Paris but has since been subsumed well within its borders. 14: You will be very French, and probably upper-middle class Bobo. You may or may not aspire to live in the 16th but almost certainly wish you lived over the border in the 5th or 6th. 15: You may well be an ex-patriated, upper-middle class or wealthy Asian. It's convenient for you to live here, since many of the Asian businesses have their offices in this arrondissement. Or you might be middle class or upper middle class French and enjoy living in the "real" neighborhood of Montparnasse, close to the 6th, 7th, and 14th without paying 6th, 7th, or 14th prices. 16: You are very French, for as many generations as anybody can trace, and come from old money. There's a greater chance if you live here that your family name starts with a "de" (meaning "of" or "from"), indicating that you are descended from traditional noble lineage. It's a quiet, largely residential, nearly business-free place. Businesses are just too gauche. 17: You are working class, middle class, or even upper middle class French and like your city life quiet. You may work at an Embassy of a country most people can't place on a map, like Lithuania or Equatorial Guinea (it's by the equator, right?). You are happy to live by the tony Parc de Monceau. 18: Are you wearing colorful African clothing, complete with long skirt and headdress? Are you possibly a new immigrant from Africa, and possibly Muslim? If so -- and even though the Great Mosque is in the 5th -- you will feel at home here. You may sell cheap imported trinkets illegally on the street. You also might live here in the Montmartre area if you're a working artist or a starving artist who dreams of being a working artist and holds a job on the side to pay your Montmartre rents. 19 & 20: You are working-class and possibly, though not necessarily, a recent immigrant. You may like easy access to prostitutes, or you may yourself be a prostitute. Or you may just like unpretentious cheaper housing outside of it all without actually enjoying any of the benefits of being in a suburb (good schools, big housing, outdoor space). Given that the arrondissements of Paris are arranged like a spiral, I think this beautiful La Pelta, stamped with a spiral, is the perfect cheese for today's story. I buy this cheese in the 14th, just on the edge of the 6th, and I photograph and eat it in the 4th.